Surf Instruction for all skill levels and ages. Beginners learn water safety, ocean awareness, equipment use, basic concepts and principles, and surf etiquette. A native of Seaside, Oregon, Tony Gardner, has been surfing and teaching others to surf for over 30 years. 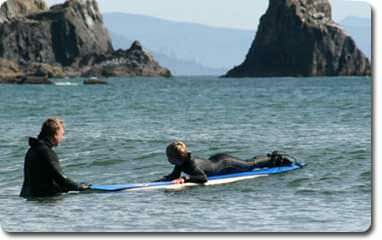 Tony’s lifetime experience in the water of the Oregon Coast, as well as his background as a lifeguard on the beach at Seaside, make him the perfect choice for surf instructor. Tony draws on his love and respect of the ocean, his vast knowledge and training, and his confidence as a teacher of both surfing and martial arts to make each surf lesson a safe, supportive and an excellent adventure! Here's a video from a student of Tony's taken down at short sands this summer(2013). This was his first time surfing! Check it out!